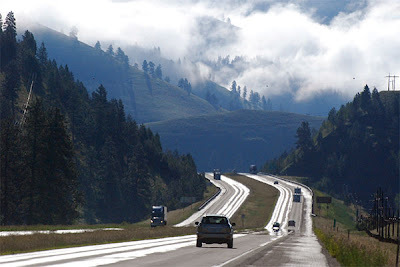 Though I love taking photographs of Montana roads, not many of my shots include modern highways. Fewer still include the Interstates ... the slash-and-burn construction philosophy behind the things can be devastating to the landscape. Montana being what it is, though, there are still plenty of settings so lovely they can't be destroyed by even the most malevolent of highway engineers. Here's one of them: this is I-90 a few miles east of Clinton, on a rainy morning in June 2007. Like it or not this is what most people see of Montana and the other states with I-whatever attached to the roads they travel. If this is the only view I ever hoped to see of a place I didn't know...I'd go on to tell people how stunning Montana is, and ache to see more. As for me, I can't wait until May and my next visit. Yep, it's true of most peoples' travels everywhere ... in the US, at least. It's interesting that in Europe, the highways are usually far less intrusive in design, yet they successfully handle high volumes of fast-moving traffic. We could learn something there. But luckily there are still plenty of undisturbed backroads out there, for those of us who understand them and appreciate them. Leave the freeways to those who don't, and to the highway engineers.